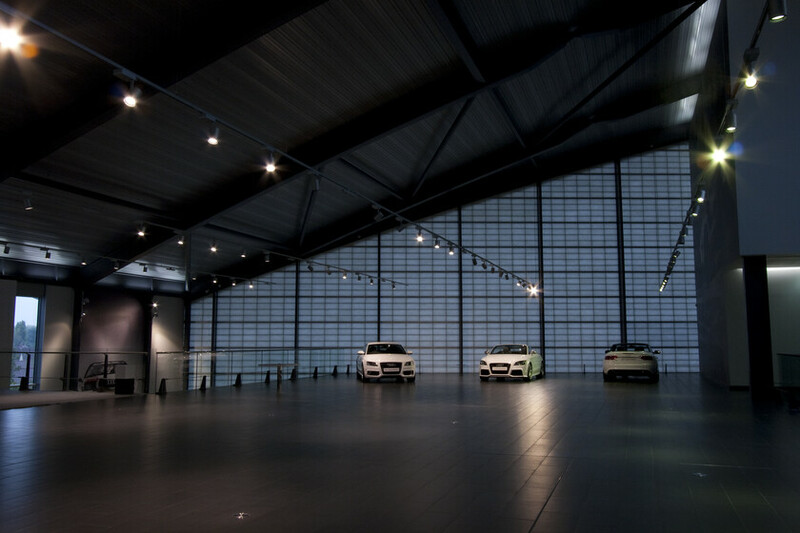 Atelier Ten were responsible for the environmental engineering, building systems and lighting design at Audi West London, the UK’s largest car retail showroom. 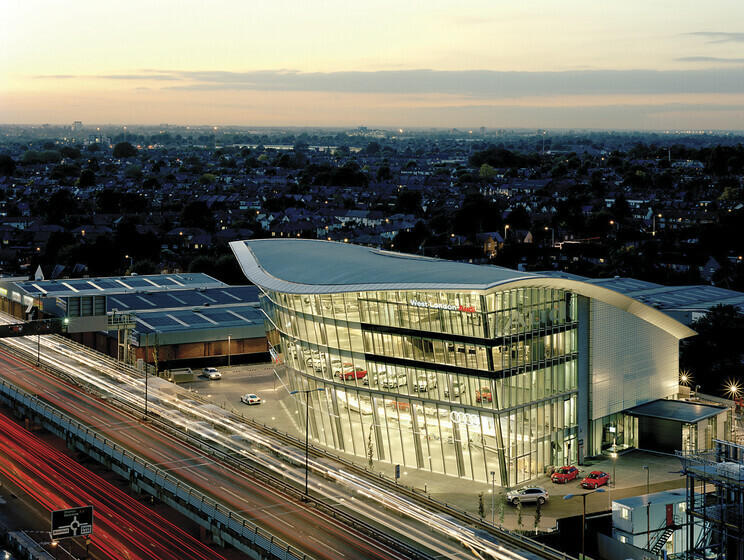 The centre covers 190,000ft² built over seven storeys incorporating three office and showroom floors capable of displaying up to 116 cars, two basement levels housing a 32-bay workshop and extensive parking facilities. The top two storeys house a business and creative complex which operates as a conference centre and office space. 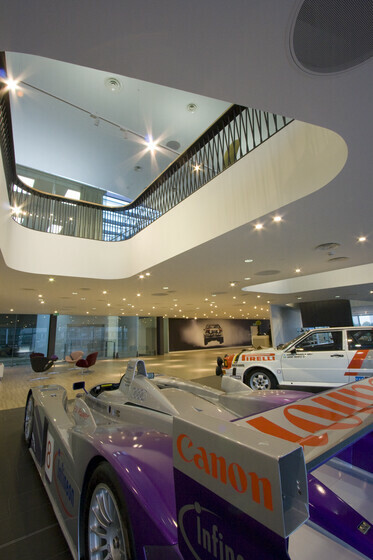 This project was an extremely challenging one on many levels, combining the environmental complexities of designing spaces for cars and people to co-exist indoors with the embedded corporate requirements of a large automobile company. The large south-facing façade and the extensively glazed east and west wing façades presented some significant solar gain issues that were overcome chiefly by working closely with the architects and glazing contractors to use a high-performance glass that predominantly reflects in the infra-red area of the spectrum but has a high degree of transparency to visible light. The air systems all include heat recovery, the air-conditioning uses variable speed drive 4-pipe fan-coil units and heating is generated from a boiler running on biodiesel fuel. While the basements experience high car movements to and from the workshops, a variable speed control ventilation system using CO sensing was still able to save more than 70% of the energy used by a constant speed system. The workshops have dedicated hose-based extract systems concealed in the floor at each service point. Wilkinson Eyre Architect’s concept required the lighting on the floors to complement the ordered grid established by the distinctive raking columns and the curved ceiling grid. While the lighting on the top two floors, designed by ATMB13, was less constrained and used a more ‘random’ layout. One of our objectives was to establish similarities between the spaces to give the building a cohesive external appearance. This was achieved by lighting the raking columns throughout the building consistently and limiting the colour temperatures of lamps between floors. As an environmental engineering practice our most challenging target was minimising the lighting energy usage. We decided upon a comprehensive lighting control system by Andromeda that would maximise efficiency using occupancy sensing and daylight dimming whenever possible. 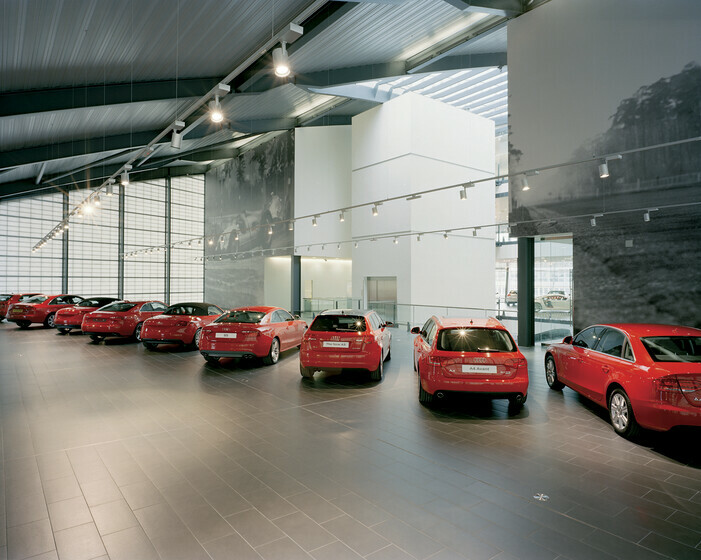 The fully-glazed façade provided enough daylight to meet the ambient lighting requirements of the front showrooms with accent lighting only used to provide highlight to the cars. In periods of reduced daylight, the ambient lighting is provided by suspended fluorescent uplights which are DALI dimmed when not required.